Brief Synopsis – A reporter decides to take a break from her job in order to care for her mother who has been diagnosed with cancer which gives her a new perspective on her parents and the lives of the whole family. My Take on it – This is another film that I knew very little about before watching it besides the fact that Meryl Streep was nominated for an Oscar for her performance here. This film does a really nice job showing the way that families deal with medical issues and how that in turn affects the family dynamics during those times of need. The story is mostly told in flashback which works well because we know some of the basic information, but the way the characters reflect on the past expands our knowledge of everything that transpired. 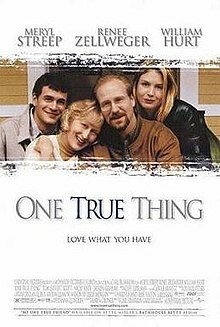 The cast is great and is led by Streep, Renee Zellweger and William Hurt and they all make things feel quite realistic. They show the path that each family member chooses to take when dealing with this unforeseen medical issue and some of these changes are for the better and some for the worst. The story is quite good and is able to touch upon some great ideas that are quite fascinating to watch being explored through the course of the film. Streep definitely was quite deserving of her Oscar nomination for this performance because it is quite easy to believe that her character is going through the events shown and deals with things in a very genuine way. Bottom Line – Does a really nice job showing how families deal with medical issues and how that changes the family dynamic in times of need. Great cast led by Streep, Zellweger and Hurt. Liked the way that this film shows the path that a family takes in these kind of situations and how each of the family members personally deals with the various changes for better or for worse. It manages to touch upon some very interesting ideas and explores them quite well the whole way through. Streep was deservingly nominated for an Oscar for est Actress for her performance here. Recommended!